This table stand attaches to any work table and allows Artograph Prism Projectors to project conveniently onto the table top, enlarging images up to 3X, or reducing them to 80% of their original size. The projector is not included. The table stand is intended for use with the standard Prism lens. It is not for use with the three-element Super Prism lens. 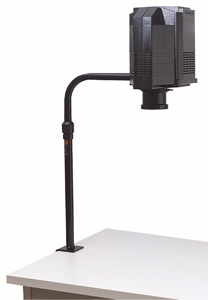 Note — The table stand cannot be used simultaneously with the Artograph Projector Floor Stand.